The study of how a multicellular organism develops from its early immature forms (zygote, larva, embryo, etc.) into an adult. is the study of how organisms grow and change over time. How an individual changes as it ages is NOT evolution. But comparing similarities and differences in how different species grow and develop can provide important clues for evolution. For example, two adult organisms can look very different even though the species are very closely related, due to a minor change in their early development. Individual development from egg to a free-living juvenile., which is the study of development from egg to free-living juvenile. A change in body form and often habits of an animal following the embryonic stage during normal development. (pl. metamorphoses), sometimes involving substantial changes in appearance. Consider the difference in appearance of a caterpillar and a butterfly, or of a tadpole and a frog. Such changes often also involve differences in habitat or diet. Other animals simply begin life as small adults, growing larger with age without much change in overall appearance other than body proportions. Consider the difference in appearance of a baby human boy and an adult man, or of a kitten and a cat. Planktonic larval type characteristic of most mollusks (including bivalves), characterized by a ciliated locomotory organ (velum) which is either discarded or resorbed at metamorphosis.) generally have larger geographic ranges, whereas those with shorter free-swimming stages (or those that are not free-swimming at all, called direct-developing) have smaller ranges. Planktonic larval type characteristic of most mollusks (including bivalves), characterized by a ciliated locomotory organ (velum) which is either discarded or resorbed at metamorphosis., which swims in the plankton, feeds (or not), grows, then settles to grow to adulthood. 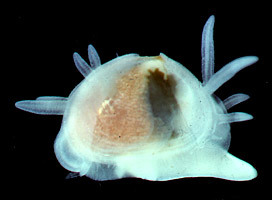 The Hard-shelled Clam (Mercenaria mercenaria) begins life as a planktonic veliger larva (left) that swims and feeds in the plankton for 12-14 days. 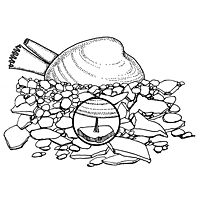 It gradually develops a foot, settles into the sand, loses its ciliated locomotory organ (the "velum"), and attaches to a piece of shell or rock with byssal threads produced by its foot (center). 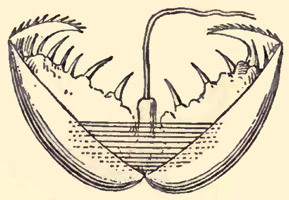 As it grows to adulthood below the surface of the sand (right), siphoning food-laden water in and out of its body through its siphons, it loses the need for (and ability to produce) the byssus, ultimately relying on its weight for stability. The Eight-Tentacled Yoyo Clam (Divariscintilla octotentaculata) with pink larvae being brooded in its gills. 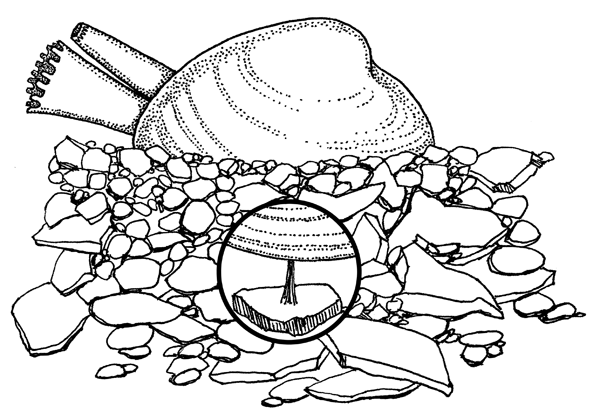 A few bivalves, including shipworms and yoyo clams (at right), actually copulate, with sperm being passed from the male to the female resulting in internal fertilization. 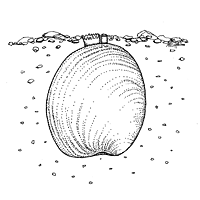 Female bivalves of still other species brood their larvae by filtering sperm from the water and retaining developing embryos within special chambers (usually in the gills). 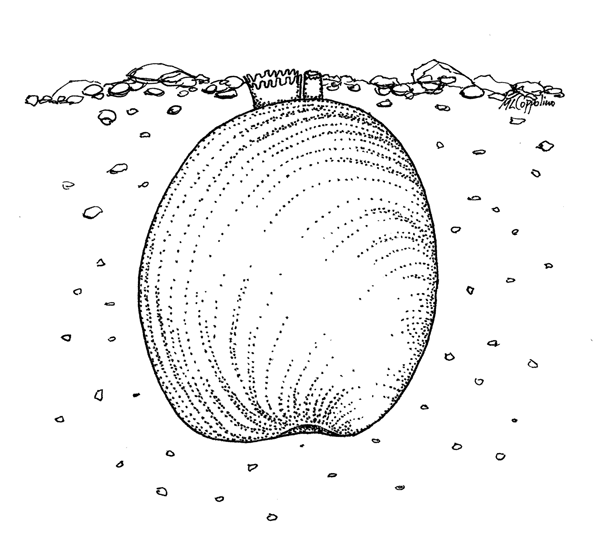 A very few species of bivalves brood their young in egg masses. The specialized larval form of freshwater pearl mussels that usually has hooks that enable it to attach itself to a host (e.g., to the gills of a fish) for a period of time before it detaches and falls to the bottom and takes on the typical form of a juvenile mussel. (pl. 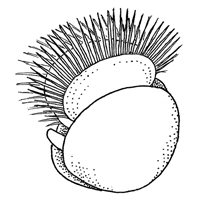 glochidia) that hooks onto the gills or fins of a fish or amphibian for a period of time before detaching and falling to the bottom to take juvenile form. 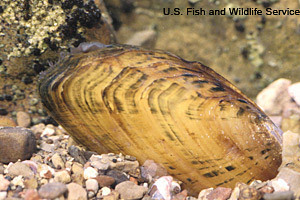 Female freshwater pearl mussels often have evolved frills or flaps at their shell margins that wave in the water currents to attract the host fish. 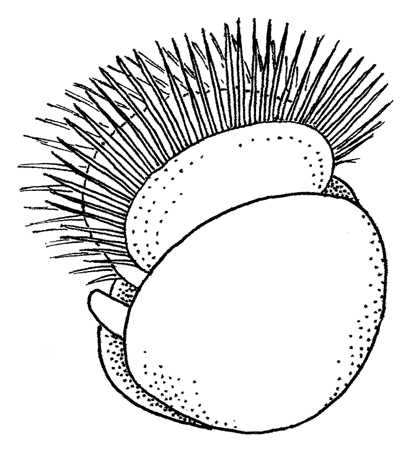 The glochidium is an adaptation to disperse young. For more about this specialized reproductive mode, see Sexual Selection in the chapter How Evolution Works: Types of Natural Selection. 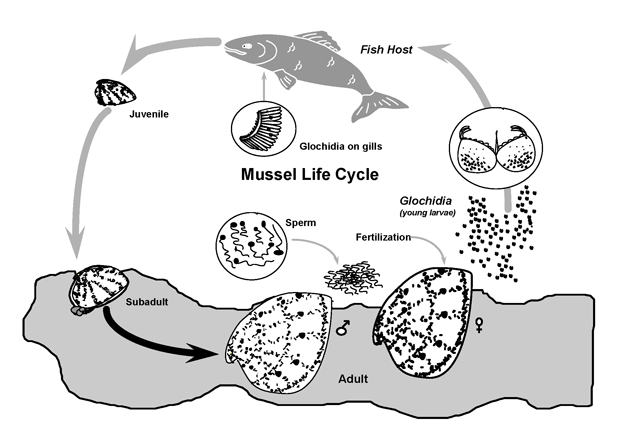 The fleshy "lure" of the freshwater Cracking Pearl Mussel (Hemistena lata) flutters in the water to attract the host fish required for its glochidia larvae. 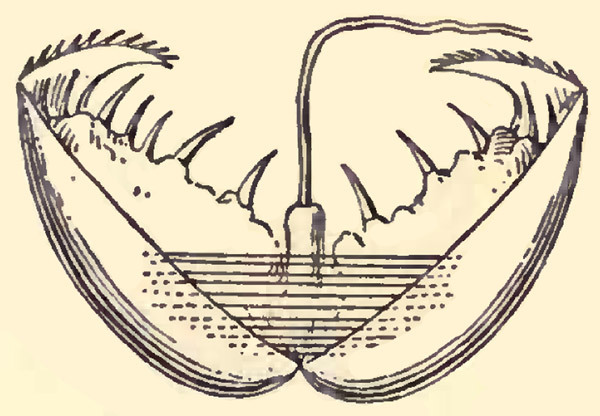 The glochidium larva of the freshwater Swan Mussel (Anodontia cygnea) is adorned with hooks for attaching to a fish. The variety of species in a sample, community, or area..